Paso Robles’ rise as a wine region is startling for anyone who can remember the days, not that long ago really, when a root beer at the late, great 21st Street Drive-In was a highlight of the culinary scene. More than 50 percent bigger in area than the Napa Valley AVA, Paso Robles rapidly went from emerging to emerged, and the industry’s growth only continues. If not literally exponential, the increase of bonded wineries in Paso Robles is nevertheless remarkable—from 29 in 1995 to 200 today. Battered by the 2003 San Simeon earthquake, downtown Paso Robles bounced back both as a culinary destination and just a pleasing place to explore. Don’t forget to bring an appetite. Thomas Hill Organics: Expect creative, farm-to-table cuisine (the bulgogi-style short ribs are as good as they get). The narrow, brick-lined bar opens to a patio perfect for warm Paso evenings. Di Raimondo’s Italian Market & Cheese Shop: Paso is getting slicker, but this throwback remains a go-to for finds like its Moliterno al Tartufo (raw sheep’s milk cheese with truffles). Taste in the Alley: Find the wine bar (the northern cousin of Pismo Beach’s Tastes of the Valleys), and you’ll discover an inventory of 400 bottles. Next Door Bistro: The casual restaurant shares an entrance with Di Raimondo’s, but its open-faced pork-and-beef meatball sandwich stands alone. Paso Underground: This wine collective’s tasting room is a pleasantly stripped-down alternative to grander operations around Paso, with four innovative small producers in a shed-like space that opens onto a patio. Hotel Cheval: Settle in with a glass of Paso’s finest and live music at the hotel’s intimate Pony Club bar, or if you stay here, attend a complimentary Sommelier’s Workshop on Saturday morning. Downtown City Park: Opened in 1908, the park’s Carnegie Library now houses the Paso Robles Area Historical Society. A weekly summer concert series takes place in the gazebo. Kreuzberg Coffee Company: Man does not live by wine alone, especially in the morning, so this is your spot for house-roasted coffee and breakfast burritos, complete with tater tots. Fish Gaucho: With its rough-hewn interior decorated with folk art retablos and panga style fishing boats, this is the place for Mexican seafood and a huge tequila and mezcal selection. Artisan: The seasonal menu taps into the local bounty, offering a fine wild boar tenderloin as well as wood-fired pies, like the one with mushrooms, leeks, and goat cheese. Although the part of Paso Robles that’s east of the 101 has such outstanding stops as Eberle Winery—known for Paso pioneer Gary Eberle’s viogniers, syrahs, and cabs—the hillier, more forested west side is the region’s prettiest part. Hop in for a tour. Vineyard Drive and Adelaida Road wind through rolling hills and beneath an oak canopy festooned with Spanish moss. Before turning onto Vineyard Drive, grab lunch at stone-walled Niner Wine Estates, whose patio looks out on rows of vines climbing a slope. Along Vineyard, you’ll find two of the area’s most architecturally dramatic wineries. Linne Calodo has a wood-plank façade with a canted roofline that nearly forms a right triangle and a clean, well-lighted tasting room (by appointment). A road sign announces the township of Roblar (population 44) before you reach Denner Vineyards (by appointment), which is notable for its six-grape Ditch Digger blend. Denner’s main facility keeps it curvy with a low-slung, rounded design that hugs the hilltop. Past a small farm with pigs and chickens, a side road leads to Proulx Wines’ simple tasting room, worth a stop for the zins and Resistance rosé. Five minutes away at the Brecon Estate, a stately oak tree frames the modern tasting room’s exterior of narrow vertical slats and a cantilevered deck that is ideal for sampling the winery’s albariño. Less than half a mile up the road, Dilécta Wines is where you’ll find the outstanding syrahs of Orion Stang, who grew up in Cambria and knows these parts well. Off to the left at the intersection of Adelaida Road, esteemed Tablas Creek Vineyard helped establish Paso’s stellar reputation for Rhône varietals. Go right on Adelaida for Paso Robles, but before returning to town, stop at Halter Ranch Vineyard. You’ll pass its 1885 Victorian farmhouse, then cross a covered bridge, a nice ceremonial entry to the impressive winery complex, where vineyard and wine cave tours are available. 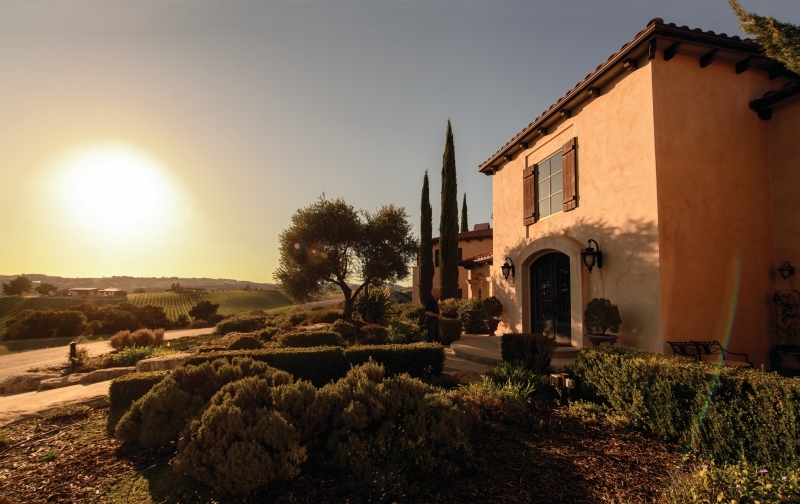 Ten minutes closer to Paso, Daou Vineyards & Winery is known equally for its complex cabernet sauvignons and a view that rivals just about any on the Central Coast. Even as more development comes to Templeton, where the grain and feed tower qualifies as a skyline, the old ranching and farming town feels far apart from Paso Robles. In a restored 1860 building with a pressed-tin ceiling on Main Street, McPhee’s Grill serves up a memorable slow-roasted pork chop glazed with ancho chile-apricot jam (above). Down the way, Chris and Mike Kobayashi, famed for Paso’s acclaimed Artisan, run Kitchenette, a latter-day, subway-tile-clad diner with dishes like mushroom and Parmesan polenta at breakfast and a lamb-dip sammy with pimiento goat cheese for lunch. Two miles away, the industrial-style Tin City, with its cluster of steel-clad buildings set amid the oaks, is kind of a polished Lompoc Wine Ghetto, with nearly 20 wine producers on site. Among them you’ll find rising star Desparada, whose owner, fiercely independent Vailia From, is known for risk-taking experimentation. She even uses terra-cotta amphorae, the style of earthen-ware vessel used in ancient winemaking. A block away, you’ll also find the big, bold, small-batch cuvées of Jacob Toft, formerly of Paso’s celebrated L’Aventure. Other than signing up for allocations through his mailing list, visiting the tasting room, by appointment, is the way to score a bottle. Off highway 46 west of Vineyard Drive, the York Mountain AVA is all about extremes. Bumping up against but separate from the broader Paso Robles AVA, which encompasses 11 individual growing regions, it’s the smallest of the area’s appellations. Roughly seven miles from the Pacific, York Mountain is also the closest AVA to the ocean, meaning it’s colder, wetter (about 50 inches of rain annually), and foggier than neighboring ones. Yet this is where it all began. The Central Coast’s earliest commercial winery started operating at York Mountain in 1882, with half an acre of Mission grapes. Ignacy Jan Paderewski, a rock star classical pianist in his day and the first prime minister of newly independent Poland after World War I, settled in the Paso Robles area and made zinfandel and petite sirah at York Mountain’s winery during the 1930s. Although decades of continuous operations at the old winery ended in 2001 (and the buildings were condemned after 2003’s San Simeon earthquake), its soul lives on in Epoch Estate Wines’ impressive tasting room. Opened in 2016, the facility is contemporary in feel yet, by local standards, positively ancient, too. The building in-orporates original bricks from the York Mountain Winery that were fired in kilns on-site way back when, while its wood beams once belonged to the circa-1872 pier in nearby Cayucos. Paderewski’s spirit infuses Epoch as well: The winery uses grapes grown on 350 acres of his old vineyard. Spirits: Grappa, limoncello, gin, brandy—they’re all being made along the ten-stop distillery trail. Two highlights: At Re:Find Handcrafted Spirits, Alex and Monica Villicana turn saignée, a grape juice by-product often used for rosés, into a vodka, while the Red Soles Still-house employs a handcrafted still from Germany to produce an absinthe that, after a few sips, may have you pricing that Montmartre atelier. Hard Ciders: At Templeton’s Tin City complex, three area winemakers turn their attention from the local grapes to Sierra Foothill apples at Tin City Cider Co. Just down the road and right off the 101 in the town of Atascadero, Bristols Cider House offers tastings of five ciders, as well as seasonal selections on tap. Don’t pass up the Mangelwurzel, which uses local red beets in the fermentation process. Craft Beer: Behind the Pour House, a taphouse with ciders and meads in addition to draft California craft beers (look for Paso’s Barrel-House Brewing Co.), you’ll find Silva Brewing. Chuck Silva made his reputation at San Diego’s Green Flash Brewing Co., and you can try his West Coast IPAs and Mind on My Orange, a Belgian-style saison made with orange peel. Paso heavyweight Firestone Walker Brewing Co. has a tasting room, too, along with tours, and a restaurant in a cavernous complex along the 101.